Going to refrain from rating because I thought I was picking up one book and instead got another. I will say that the book's title and synopsis doesn't clearly show how this is more of a self-help and advice book than anything else. 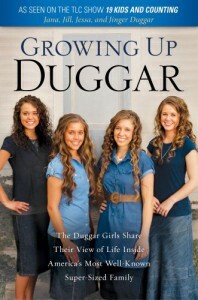 I thought we were going to be shown a variety of stories, recollections, and experiences from the girls' childhood through adulthood, based on how the synopsis reads (although I did figure that the girls would also field the questions regarding if they agree with the lifestyle set for them by their parents). I thought it might be interesting to read about how a massive family cooks, works, plays, and learns as a unit, because you know there's going to be a unique set of challenges in doing so. I had no clue that the majority of the book was going to be answering questions about their beliefs and breaking down what every aspect of their faith means to them. Not that I have a problem with that specifically, but I was more curious to see "behind the scenes" of what living in a large family was like. I wasn't trying to get a crash course on the details of what they believe is right and wrong. I'd suggest to the publishers that they change the title or synopsis to make clear that the book is less about fun family antics (even though there are a few included, along with pictures) and more about detailing the family's spiritual guidelines.